Recently my bed bug dog inspected 70 studio or one bedroom apartments each day for two days back to back and did a thorough job. The third day was a Monday and over that weekend we inspected a three unit bldg that definitely had bed bugs. On Monday my bed bug dog did a number of alerts on what had been a bug free building in the previous two day search. I tried more frequent breaks and switching up the search pattern but to no avail. We had ten alerts in 70 units. I offered to return free of charge to redo the rooms with alerts. Because of their scheduling conflicts we waited a week before returning. Upon our return, sure enough, no alerts on those units. So as a dog trainer I need to figure out what happened to cause my dog to false alert. Very veteran dogs will have built up more ‘nose time’ (length of time they are able to effectively and reliably search). My bed bug dog is young, she just turned two years old so, although she was focused the entire time (she is a malinois cross and those dogs will work forever) she obviously was not being reliable that third day. Over time that schedule will probably be fine but at this point I will monitor the number of units per day and also the back to back days that have long inspection hours. Inspections are a dance that the handler and dog do together. It is up to the handler to know their dog, read their dog and communicate to the facility manager the honest outcome. If a handler gets an alert that he doesn’t totally believe (all dogs will false alert at times) then he needs to be honest about it. The search can be redone at a later date, or the dog might just need a break and will then be fresh to either confirm or negate. I also bring vials along on my searches, either live bed bug vials or pseudo scent. My dog will happily alert on either. I periodically hide a vial during long searches so my dog has a successful find and gets his reward (toy/treat). That reinforces him to thoroughly inspect for me and keeps his head in the game. My belief is that 70 units is a max for a dog per day. If someone agrees to do 100 units in a day with one dog, I would question how effective that search is. Bed bugs have a very small scent cone compared to other disciplines (human remains or narcotics etc). 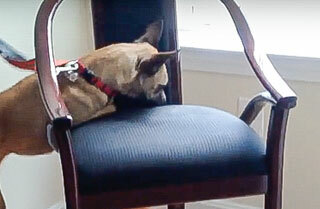 Dogs have to detail to get their nose close enough to the cone to find the bed bugs. At times with more air circulation a dog can scent the bugs upon entering the room especially in the case of an infestation. But with an infestation oftentimes you see the bugs and don’t need dogs except maybe to check the adjoining units (they migrate). But at times the scent cone is as small as six inches so walking a dog into the middle of the room and leaving is not an adequate search. Detailing a room requires lots of training and lots of energy. A dog that is thoroughly detailing will take longer to search and cannot search as many units. My bed bug dog loses weight when we are doing lots of inspections and I need to up her food. Dogs expend lots of energy searching; even if they aren’t moving quickly. You can hear them sniffing. Veteran bed bug dogs can do more back to back heavy schedules but my friend who has a dog that has inspected eight years still likes to have an easy day between heavy inspection days. As a facility manager you want an honest team that will report honest results and you also need to realize that a bed bug dog is a dog and they will have off days. It’s up to the handler to know and represent their dog and communicate the findings to their clients. Rushing through an inspection with a limited number of dogs is not in anyone’s best interest. It’s not fair for the dogs and you are not getting the best searches and most reliable outcomes. Work with the bed bug dog teams and if there is flexibility you will get results that you can trust. Bed bugs are difficult to eradicate once you have them. Personally I would not attempt to treat on my own. Once there is an infestation, a professional tretament service will address the visual problem but also the hidden problem behind walls and under floor boards. It’s time to get professional bed bug treatment. There are times when waiting to treat makes sense. We had a call and did a search in Townsend MA on January 2. The family had visited relatives in Maine. The wife had gotten bitten and when she went to the dermatologist it was suggested that her bites might be bed bugs. She decided to bring in a bed bug dog to see if they had brought any bed bugs back to their home in Townsend. The bites were typical of the lines with bed bugs and she didn’t believe she had gotten any bites since she had come back but wanted to see if there were any bed bugs in her home. I suggested that her relatives have their home inspected as well. But as it turned out, that wasn’t necessary as the relatives had already seen bed bugs at their home shortly after the visit. Bed bug dog Spice alerted upstairs on a cot in a bag that they had used in Maine. Spice actually stuck her head inside the bag then sat. She also alerted on a gym bag. She stuck her head in the bag then sat (her alert) on top of the bag so she was pretty clear where she smelled bed bugs. The owner put the cot bag outside in freezing temps but will need to be treated as cold cannot be relied upon. The gym bag got thrown in the dryer. The bag had gone to Maine and carried back all of their clothing which they had dried upon their return but had done nothing with the bag. Rather than immediately treat since it was not clear that any bugs had migrated from the bags, the owner elected to wait 3-4 weeks to see if she gets any more bites. Either way I will return in four weeks to recheck the house with bed bug dog Spice. Four weeks will be sufficient time for any eggs to hatch and for bed bugs to migrate to human hosts in the house. Also, if they are in the house there will be an established scent pool when Spice and I return to search. Our return trip at no charge will give her piece of mind. If she sees bed bugs in the interim we will not need to return, she will treat. If she starts getting bitten we will go back to try to get location an then visual confirmation. Hopefully moving and taking action on the bags will be sufficient to address her potential bed bug problem. It’s much cheaper to hire a bed bug dog than to treat for bed bugs. pre-inspection checklist here and contact us to set up your appointment. © 2016 Bed Bug Detection K9s.